Help EADSM to investigate how dental sleep medicine is practised in Europe. Please fill in the questionnaire. It will take only 15 minutes of your time, but is of great importance. To find out how snoring patients are received, screened and treated in general medical and dental practice in that country. We are specifically interested in Hospital treatment (specialist departments). We would like to find out specifically what the national representatives would like the EADSM to provide (we will work out how and/or if this can be achieved later). Information must be provided from a General Dentist perspective. 1. In which European country do you practice? 3. Where do snoring patients requesting treatment usually first present in your country? 4. How are snoring patients usually received for treatment with mandibular repositioning devices (MRDs) in Dental practice? 5. How are snoring patients screened for obstructive sleep apnoea (OSA) prior to treatment with and MRD? 6. What screening procedures for OSA are routinely carried out in Dental Practice? 7. Do you personally consider that suitably trained GDPs have a role in screening for OSA? 8. How are GDPs trained in the use of MRDs in your country? 9. Does the EADSM have a role in providing training in basic Dental Sleep Medicine and the provision of MRDs in your country? 10. What categories of patients in your country are generally considered suitable for MRD therapy in your country? 11. What reimbursement do snoring patients receive for their MRD treatment in your country? 12. Which categories of patients are entitled to reimbursement for MRD treatment? 13. Who funds the MRD therapy reimbursement? 14. Which categories of patients are entitled to reimbursement for CPAP treatment? 15. Who funds the CPAP therapy reimbursement? 16. What post treatment investigations are routinely carried out for patients treated with an MRD? 17. If a snoring patient (requesting MRD treatment) presenting in general dental practice is referred for diagnosis to an ENT / OTL / Sleep Physician, what is average delay before treatment is initiated? 18. How are MRD patients followed up in general practice? 19. Does your country’s ‘Dental Indemnity Insurance Society’ have a position statement on GDPs treating snoring patients in General Practice (including screening for OSA)? 20. If there was a simple, effective, ‘screening tool’ available which would help you identify those snoring patients more likely to be suffering from OSA (and therefore suitable for referral to a specialist ENT / OTL / Sleep Physician) would you be interested in using it in general practice? 21. Do you consider that the snoring ‘treatment/referral pathway’ is satisfactory in your country? 22. What is good about the snoring ‘treatment/ referral pathway’ in your country? 23. How could the snoring ‘treatment/ referral pathway’ in your country be improved? 24. Does the EADSM have a role in providing training in advanced Dental Sleep Medicine in your country? 25. Would there be an interest in GDP Dental Sleep Medicine accreditation in your country? 26. Is there an active National Dental Sleep Medicine Society in your country? 27. Are you a member of your National Dental Sleep Medicine Society? 28. If not, can you provide contact details of your National Society? 29. Would you be interested in help to set up your own National Society? 30. Would you value access to the International Journal of Sleep and Breathing? 31. 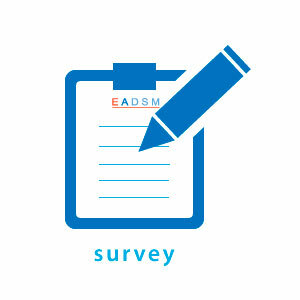 Would you like to contribute to EADSM with your knowledge? Thanks for your interest in EADSM. We offer a membership. More information on the website (membership) or we can contact you. Please choose you best option(s). Please fill in your email address, so we can contact you. Please fill in your phonenumber, so we can contact you. Your contribution is highly appreciated. Thank you!